DEAR JERRY: Like most pop music lovers, I never heard the names Simon and Garfunkel until “The Sound of Silence” came out. In fact, I once read a list of artists whose very first recording became No. 1, and Simon and Garfunkel were among them. Turns out that may not be true. Paul Simon and Art Garfunkel apparently made several records before “The Sound of Silence,” though none reached No. 1. That might disqualify them. Can you fill us in on everything they made before “The Sound of Silence”? DEAR JERRY: Barring a wildly improbable loophole, Simon and Garfunkel should not be on that list of artists whose very first recording became No. 1. “The Sound of Silence” made its chart debut in late November, 1965. By then, Paul and Art, separately and together, had no less than 21 commercially-issued singles and one album under their belt. Other than their first LP, “Wednesday Morning, 3AM,” released in late 1964 a full year before “The Sound of Silence” single, all of their earlier works are credited to any of several pseudonyms. Childhood friends and classmates, Art and Paul's first recording, “Hey, Schoolgirl” (Big 613), came out in 1957. Though the songwriting credit on the label reads “A. Garfunkel & P. Simon,” the duo chose to be known professionally as Tom & Jerry. “Hey, Schoolgirl,” one of their many tunes inspired by the Everly Brothers, sold surprisingly well, and made the national Top 50. It is also the most successful of all their pre-'64 recordings. For the follow-up, “Our Song” (Big 616), Art and Paul each adopted a nom de plume for the writing credit to better match the Tom & Jerry act. Garfunkel became Tommy Graph and Simon chose Jerry Landis. Naturally, everyone assumed those to be the full and real names of Tom & Jerry. Besides “Our Song,” other 1958-'59 Tom & Jerry singles are “That's My Story” (Big 618); reissues of “Hey, Schoolgirl” (King 5167) and “That's My Story” (Hunt 319); and the unexpected pairing of “Baby Talk” (Big 621), performed by a completely different “Tom & Jerry” duo. Backing “Baby Talk” is a recycling of the real Tom & Jerry's “Two Teen-Agers,” originally the B-side of “Our Song” (Big 616). Though it does not feature Simon or Garfunkel, a budget label edition of “Baby Talk” (Bell 120) also came out in 1959. Known for their “ghost records,” Bell specialized in having unknown artists attempt to replicate current hit songs, which retailed for just 59-cents. Understandably, having nothing to do with Simon or Garfunkel has not prevented “Baby Talk” from mistakenly being included as part of Tom & Jerry's discography. Apart from their Tom & Jerry releases in 1958 and '59, Art and Paul also recorded solo. Calling himself True Taylor, Simon waxed “True Or False” (Big 614), then, as Jerry Landis, made the delightful “Anna Belle” (MGM 12822). Meanwhile, Art Garfunkel, as Artie Garr, crafted “Beat Love” (Warwick 515), a timely tune for the beatnik era. The second and final Artie Garr single is “Private World” (Octavia 8002), a 1961 issue. Simon followed his pal to Warwick, where he maintained his Jerry Landis persona for three 1960 and '61 singles: “Shy” (Warwick 552); “I'd Like to Be” (Warwick 588); and “Play Me a Sad Song” (Warwick 619). Also in 1961, Paul reached into his bag of stage names and came up with Tico and the Triumphs. Over the next year, five Tico singles followed: “Motorcycle” (Madison 169); a reissue of “Motorcycle” (Amy 835); “Express Train” (Amy 845); “Cry, Little Boy, Cry” (Amy 860); and “Cards of Love” (Amy 876). For these, the writing credit still reads Jerry Landis. Paul returns to performing as Landis on the next two 45s: “I Wish I Weren't in Love” (Canadian American 130) and “The Lone Teen Ranger” (Amy 875). Both “Motorcycle” and “The Lone Teen Ranger” had regional Top 40 success, but didn't do much nationally. Opting for yet another pseudonym, this one being Paul Kane, Simon's lone 1963 single is “Carlos Dominguez” (Tribute 128). Bootleg copies issued years later are easily identified as they credit Paul Simon instead of Kane. Which brings us to 1964, when the guys signed with Columbia and finally started using their real names. 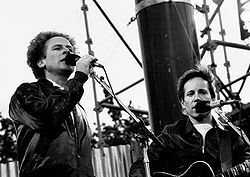 For Simon & Garfunkel it only took them eight years of flops, fantasies, and fortitude to become an overnight success. From 1961 through '63, guitarists Tommy Tomlinson and Jerry Kennedy made numerous singles and albums of instrumentals for the Mercury label.